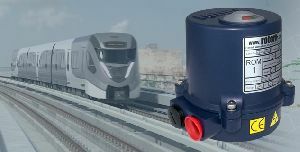 Rotork has won the contract to supply 2,500 ROM electric valve actuators for tunnel ventilation dampers on the new Doha Metro. Rotork ROM actuators are robustly constructed to provide quiet and reliable operation for dampers and louvres, as well as all kinds of small ball and butterfly valves. Standard features of the compact design include an IP68 watertight enclosure, self-locking operation, local visual indication, manual override and suitability for a wide range of supply voltages. Currently under construction, the Doha Metro is a rapid transit system in the capital city of Qatar that is scheduled to be operational by the end of 2019. It will have four lines running mainly underground with an approximate overall length of 300 km and 100 stations. Numerous dampers installed along the lines will provide important ventilation duties, including vital safety functions in the event of an underground fire. Find out more about the ROM.